Match the size of the pan to the heating element. 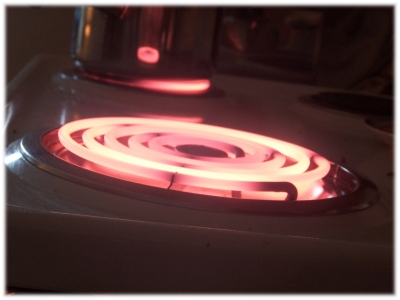 More heat will get into the pan and less will be lost to surrounding air. When using the oven, try to plan oven meals to accommodate more than one dish at a time. Avoid opening the oven from time to time. Heat is wasted every time it is opened. Match the cooking container size to the range’s surface unit. Control heat. Fry pans, toasters and similar small appliances cook well and use less electricity than range - use them for small meals. Plan the use of oven wisely because each time the oven is used, the entire cavity is heated. When operating an electric oven, attempt to cook the meal as much as possible. Food with different cooking temperatures can often be cooked simultaneously at one temperature – variations of 25 degrees in either direction still produce good results and save energy.